Our lift maintenance crew has been busy this summer replacing parts and performing all sorts of safety checks on our lifts. Everything has to be inspected by the time anyone takes a ride. Every cable, grip, chair, wheel, motor, weight, etc gets special attention during the summer to make sure everything checks out. We refer to our chairlifts as Lift 1, 2, 3 while they have a little snazier names for the public (Take Four, West End, and EZ Rider). 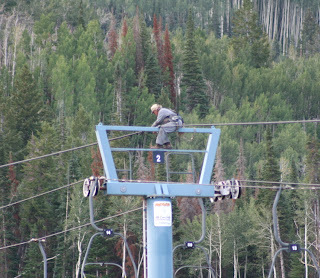 Today they are performing some work on top of the towers of chair 3 (EZ Rider).